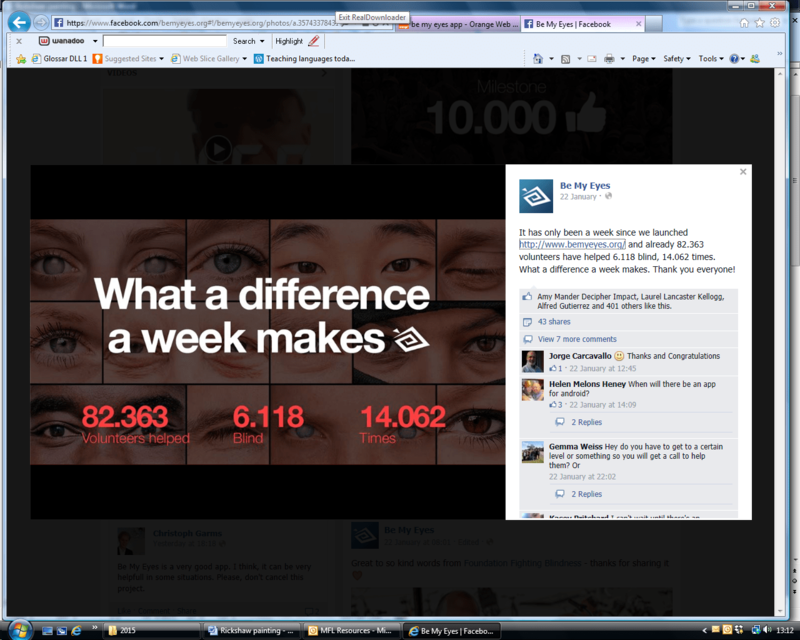 The new app Be My Eyes in just one day after launching, had over 10,000 users. I’m always really interested, as I’m sure you are, in medical advances and new technology that transforms lives. On both sides of my family people have suffered with very serious problems with eyesight and this app sounds amazing. We are touched when someone we know could benefit from help, and the pupils we teach are too. If as teachers we select something that we are moved by, the impact can be great. What catches your attention? The Facebook page entry below certainly caught my mine. How kind of all these people to be willing to spare time. Headline news can be used in language lessons as starter activities. Here are a few things from the last few days you might be able to use. We can use these with young learners to recap numbers and express simple opinions and older students to discuss advances in technology. This website is a great source for teaching languages. It is really easy to choose a headline as a short reading activity which will also promote classroom talk. 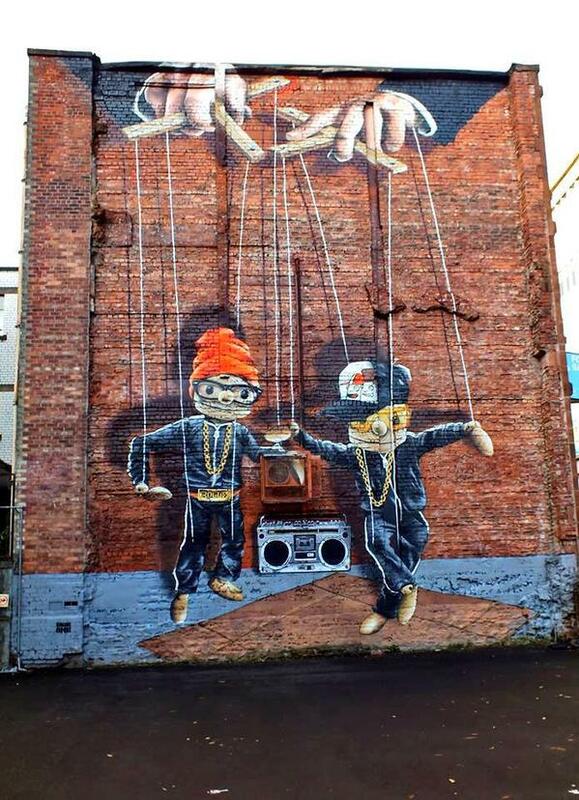 This is on a wall in Glasgow. I love this painting! The source is Artistic Ideas. Again the potential of exploiting this for learners at any stage of learning is enormous. two teachers for setting this up, Will Strange Harrogate Grammar School and Diana Miller Rastrick High School , both MFL specialists! Further information can be found here. Early bird registration is now open for the ALL annual conference in Newcastle on 20th and 21st March, which is an amazing source of new ideas! I really recommend attending. Reductions are available until 31st January. Blogs are a source of ideas. Janet Lloyd tweeted one of the post from her blog and it seemed to follow on so well from what I was saying last week, I thought I’d put the link in here and this quotation. We want our children to progress in their independent use of language! Incorporating a new idea into your lesson plan. So, whatever age group you teach, what questions could pupils ask this rickshaw painter? It is so important for pupils to be able to form and ask questions in the target language and not just answer them! This is a focus of the new PoS. How about making up questions for an imaginary guest in class? Maybe this will be a common thing in our schools in the future? Have a look at picture 2 in the link above as an example. ‘And today’s virtual guest is…’ This is an idea for a language class! If pupils want to ask or even complain about something, let them complain if they can do it in the target language! It might be during snowy weather … they might want to say in Sheffield, “Why isn’t our school closed, some are?” They might just want to express an opinion to a politician… I’d love to hear your ideas too!